I copied this from my blog and I’m adding this first paragraph for the PTO blog. Since you might not be familiar with Missouri, Branson is located 4 hours SW of St. Louis. It has a huge theater district with most of the shows being country singers past their prime. 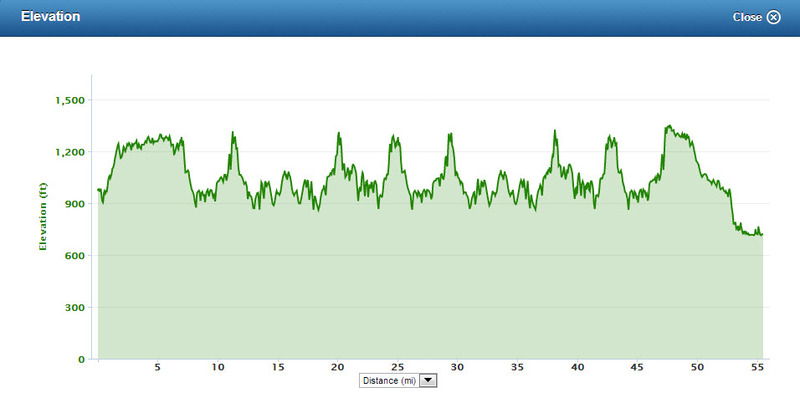 It is also very hilly and might be considered one of the hardest 70.3 (WTC) races. 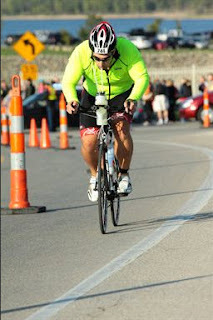 I was told many times that it’s tough bike course when people found out which race I was doing. It’s also probably one of the few WTC races you can sign up for on site since it wasn’t even close to capacity. There were 601 male finishers and 141 female finishers. If you’ve read previous posts you would know that I was trying to decide between Branson and Redman. Club Nationals were at Redman this year and a lot of people were heading down there. 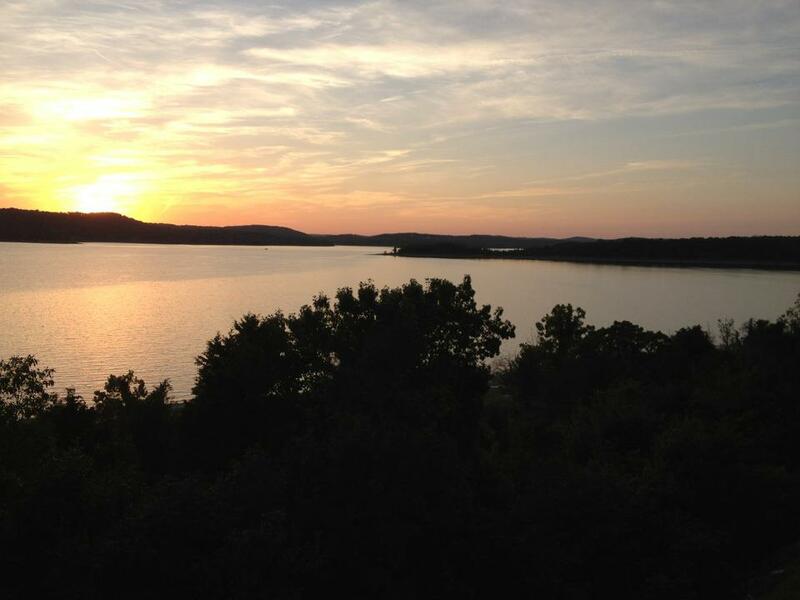 I ended up picking Branson since I told my parents they could come that week and then spend the weekend in Branson. I feel bad since they probably didn’t get to see much in Branson while they were there. 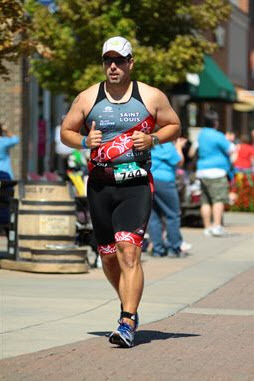 I still can’t decide if I made the right choice on races…hilly and 50-60 or mostly flat and 91 degrees (as I was told). We got to the condo on Friday night and were treated to this lovely sight. Then we headed out to Branson Landing for dinner to checkout the welcome concert and the finish area. I think there were more people not doing the race watching the concert. After that we just went back home and went to sleep. Saturday morning I headed over to a packed packet pickup at 10:15. Judging by the size of the line, I thought I would be waiting over an hour. A couple minutes later a woman asked if I have a current USAT card…yes I do…OK, you can go into that much shorter line. After standing in that line for a few minutes, I could finally see the little signs with 1-400, 401-800 and 800 and up near the tables. I also noticed people looking at papers on a table. I figured I should probably go see what my number is. 744…great, I can stand in a much shorter line! (I wish I had pictures of the line.) I ended up forgetting my chip. It’s a good thing I remembered when I went back there for the info meeting. I also found out that no one was at registration/packet pick up at 1pm. I don’t know if there is any advantage with going early unless they run out of stuff. It’s amazing how many people aren’t USAT members. After getting my number and shirt, I headed over to see what things that let me brag about my race souvenirs I can spend my money on. That would turn out to be a cowbell, a water bottle, a pint glass and a cycling jersey. It was pretty low-key after that until I woke up the next morning. Posting race nutrition seems to be the trend so here is my prerace meal. Since the race is a point to point race, the suggested plan of action was to drive to T2 in the morning and then take a bus to T1. So, I woke up, drove to T2, dropped off my running gear, found some tri club peoples, waited in line for about 20 minutes for a bus, watched the line grow to several hundred people (I was about 30th), got on the bus for what seemed to be the longest shuttle ride I’ve ever taken, got off said bus and walked to T1. Supposedly there were at least 5 buses running from 4:30-8. Due to our 20 minute wait, I wonder how many of those buses existed/were full. My parents and the nurse confirmed that the buses existed. One thing I was unaware about IM events is that they are transition nazis. 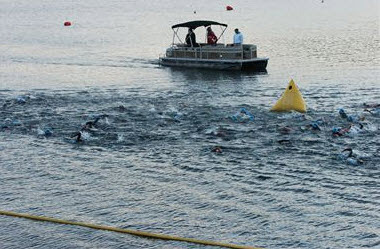 Why do I need to start leaving transition 30 minutes before the race, especially when the athlete guide says 15 minutes? It’s already a long day, why make people wake up 15 minutes earlier just to stand around in 45 degree weather. Through the use of my cell phone, which I was reluctant to bring in case I didn’t find my entourage, I found my entourage. I exited transition to say hi and to put on suntan lotion. 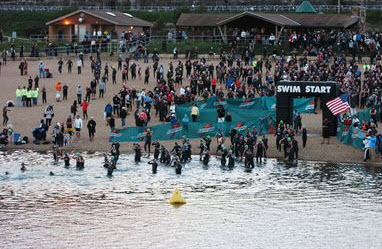 The nurse suggested I reapply after the swim so, I went back in to transition and was not let out of T1 the same way as before. I tried to reason with a volunteer that it didn’t matter which way I exited as long as I exited as all exits lead to the beach. He didn’t agree. Another volunteer asked what was wrong and I pointed to the nurse and asked if he would tell them I need to meet them on the beach. So, we met on the beach and waited around for about 45 minutes until my wave started. The walk up the beach was slow. I didn’t bother to run since I still had the whole day in front of me and knew I’d have to take it easy on the bike. It is a race but, I didn’t understand why people were flying by me. You’re probably not going to PR in Branson but, whatever floats your boat. T1 was slow. I dried off since it was cold and stuffed everything into the green bag hoping it would show up in T2. The only plus to my bag not showing up was the excuse to buy a new wetsuit…It showed up. For the first time ever in a tri, I threw on a long sleeve bike jersey since it was still around 50 degrees. Best decision of the day, thanks to the nurse. I put my shoes on and headed for the hills. I should note that I changed from a 12-25 to 12-27 cassette so I could spin up the hills a little easier. The course went uphill for 6 miles to the “high road.” I chatted with one of my friends for a little bit on the ride which took my mind off the hills for a bit. Then, I picked up a bottle at the first aid station, threw it in my back pocket in case I needed it and said “you first” to my friend before the first descent. 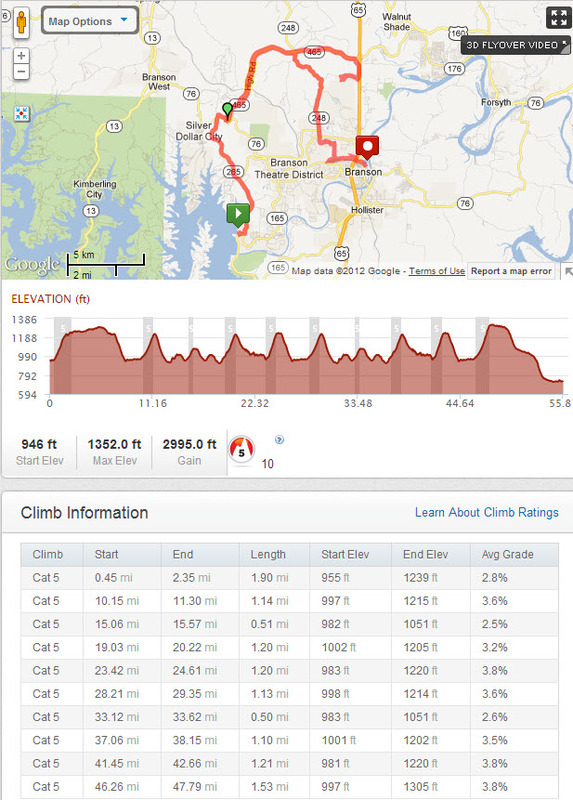 I’ve heard people say they hit 45-50 mph in Branson and I’m not surprised given how long the descents are. I’m not afraid of going fast but, I’m afraid of crashing as a result of going fast. I did a bit of reasoning right before I got to the first downhill…it would be tough to slow to less than 30 mph and if I’m going to crash the chances can’t be much higher if I’m going 40. Plus, crashing at 30 mph will more than likely hurt just as much as at 40 mph. Therefore, I will not touch the brakes unless absolutely necessary. Lots of climbing and descending if you can’t tell. 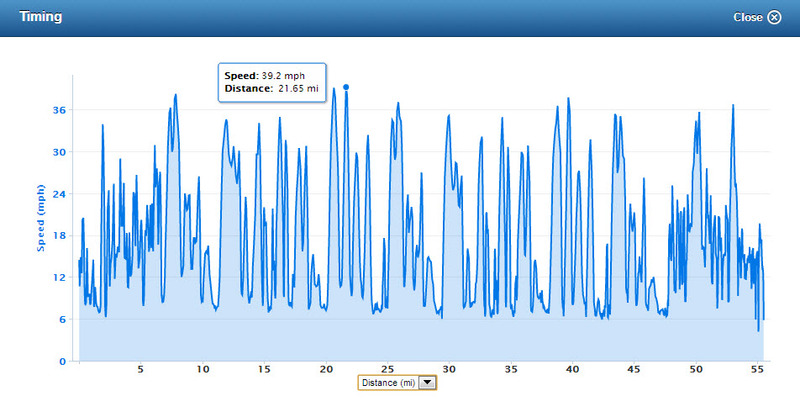 I maxed out at 39.8 mph and did most of the climbs under 10 mph. The climbing didn’t seem too bad at first but on the last loop around I was tired of and from climbing. I seriously wondered if I was going to make it. Around mile 40 or so I could tell my legs had the potential to cramp up. Not good. So, I popped two salt tabs and finished almost all my water since there was an aid station coming up. At that point I didn’t care what my time was, I just wanted to make it up the last hill before I cramped. If I didn’t I might run the risk of not finishing the race. Even though there is an 8 1/2 hour cut off, people still posted times over 9:30 when the last group started 40 minutes after the first. Theoretically the cut off should have been 9:10 for the first group. Anyway, if I had to walk up that hill I knew I was probably done. Thankfully, I only had a lot of pain in my right quad on the last hill. Mostly due to the fact that it was up an exit ramp to the highest point I had been, then you turn the corner and climb a little more. 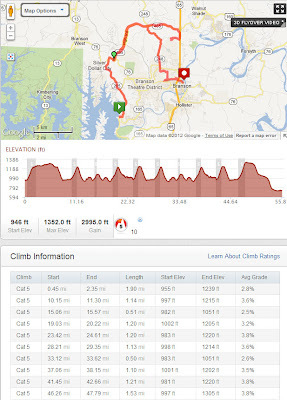 If you look at the climb data you’ll notice the last climb is at least 75 feet higher than the rest. I was extremely relieved when I made it to the top and crushed when I saw how long the bike had taken and I still had 4 miles to go. It was ALMOST all downhill after that. There was one extreme drop that I did brake on because I thought I had to turn at the bottom but alas, there was another 500 feet to a U-turn. The last bit was mostly flat but as soon as you think you’re done you turn the corner and have to go up what looks like a 50-75 foot wall. 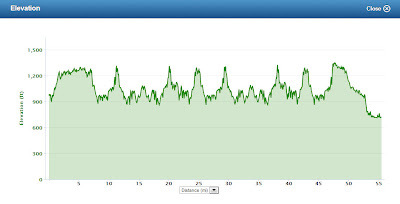 I thought I was done with hills so the following went through my mind…$o^ofai3i@ch! M@t%erfing are you Fing KIDDING ME! Then I got off my bike and walked up the hill in fear of my quads cramping up if I stood up to climb the wall. 1000 Calories is not enough. I was planning on taking in almost 1200 but, I didn’t eat the last waffle. I should have planned on eating closer to 1800 calories (4 cal/kg/hour = about 440 cals/hr) since I was out there for 4 hours. At least I did a better job with the sodium. Then I got to T2. I was not a happy camper. I thought I was done at that point but there was no way in hell I’m stopping after all that with a flat run ahead of me. I saw my dad and I think I waved. My mom took the photo above and was screaming at me along with some other woman who I’m guessing she told who I was. I just kept walking and racked my bike. All I wanted to do was get the run over with. Interestingly enough, I perked up a bit on the run. The run, much like the bike course, is pancake flat. 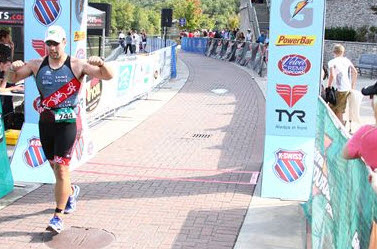 It’s three loops that tease you in typical Ironman fashion as you pass the finish twice before crossing it. 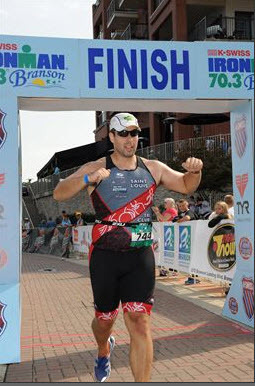 You also run through Branson Landing which made things a bit exciting. My parents, the nurse and Loki were all at the run start to cheer me on. Again, I was not in a great mood so I slogged on. Due to the pancake nature of the run, I managed to “run” the first 4 miles only walking at aid stations. The run wasn’t that bad as the three loops made it easy to set little goals like, I’m going to run the loop around the park or I’m going to run to the turn around, since I mostly knew what was coming up after the first loop. The only bad part was they ran out of Coke and my stomach wouldn’t settle down. I figured this would happen so the plan was to take in more calories on the bike but, it’s not easy to eat stinger waffles when you’re constantly going up and down hills. The pup finally noticed me on one loop. The last loop was a lot of speed walking. I think I did one mile at 16 min/mile while walking. If you know how much I hate walking fast you would be shocked. I tried to run the last loop around the park but that wasn’t happening. When I tried to run my heart rate was shooting up to the 130s fairly quickly and I was feeling out of breath at such a low HR. Needless to say, I was pretty happy when I was finally able to go left to the finish. This was difficult since water was making my stomach rumble and I didn’t want to take on electrolytes if I wasn’t drinking water. Same thing goes for the Gel. After awhile my stomach did settle so I had about 3 servings of gel and at least 2 saltstick caps. Overall I’m happy with the way things went. 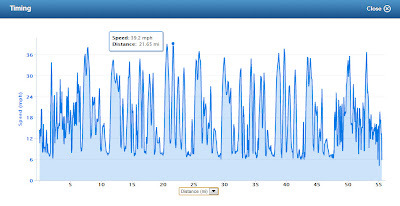 Even though I hadn’t biked for a month I was optimistic about my bike time but, I wasn’t surprised when I needed a lot of time to recover after each hill on the second part of the bike. It’s difficult to say if I would do this one again.